Cost: $8 per student and per chaperone. Teacher admission is always complimentary! Programs are held rain or shine. Make sure students are dressed appropriately for the weather and outdoor activities. Cancellations must be made 14 days in advance of the scheduled program or you may be responsible for 25% of your field trip cost. If possible, your visit may be rescheduled for another date. If we cancel your program due to severe weather, we will attempt to reschedule a date convenient to both parties at no additional cost. Students will learn about the life cycle of a plant and will get to plant a flower of their own to take home. Summer brings warmer weather, a productive garden and extra time to enjoy all that the farm has to offer. Fall means pumpkins, cooler weather, and an opportunity to see the farm as we prepare for harvest. A self-guided experience for groups of all ages to explore at their own pace and discover all the farm has to offer. Students learn the story of the Funderbergs, the pioneer family who first settled on the Farm. PreK – Kindergartners will enjoy a day of discovery by using their five senses while at each of our favorite spots around the farm. Kindergartners -1st Graders will enjoy a day on the farm exploring all things living and nonliving! 2nd – 3rd graders will enjoy a day of discovery as we compare the similarities and differences between people, plants, and animals found at the farm! We welcome the opportunity to work with you and develop a program that fits your curriculum. 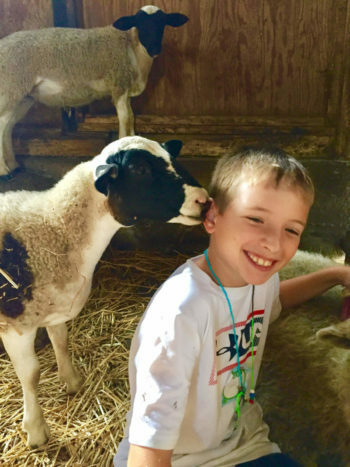 Scouts, learners with disabilities, church groups and others can use the farm as their outdoor classroom for a variety of topics including STEAM, history and environmental education. Contact us at [email protected] to discuss the possibilities!